Scott Fly Rod Company has just released their highly anticipated response to Sage ONE….fly nation meet Scott Radian! NEW Scott Radian Fly Rod Free Shipping :: Buy Online! Scott fly rod designers had a tall task of building a new fly rod that would stack up against Sage’s overwhelmingly well received (and rightfully so) Sage ONE reviews. I’m happy to report the boys and gals at Scott continue to impress! I loved my Scott S4 series rods but for the last few years it was hard for me to pick up anything other than a Sage ONE on my way to the river. I thought we might have an S5 in 2013, but instead we got a New two Hand rod the Scott T3H. As a two hand rod junky, I selfishly didn’t complain, but I quietly thought Scott really needed to make a new rod badly to keep up with Sage ONE. Scott’s New Radian is Another Reminder of What Scott Fly Rod Company is All About! Scott Fly Rod Co. | Behind the Scenes from FELT SOUL MEDIA on Vimeo. After having both cast and fished with the new Scott Radian, it all makes sense. I’m also humbly reminded again of What Scott Fly Rod Company is all about, and it isn’t keeping up with the Jones. Scott could have quickly slapped together an all new and unimpressive rod to quickly match the hype of Sage ONE. Instead, they did what they have done all along and that is to perfect a rod before releasing it. The time has finally come and the Scott Radian is right on the money in all the ways I rate & review fly rods. Criteria 1: How Does the Scott Radian Cast? 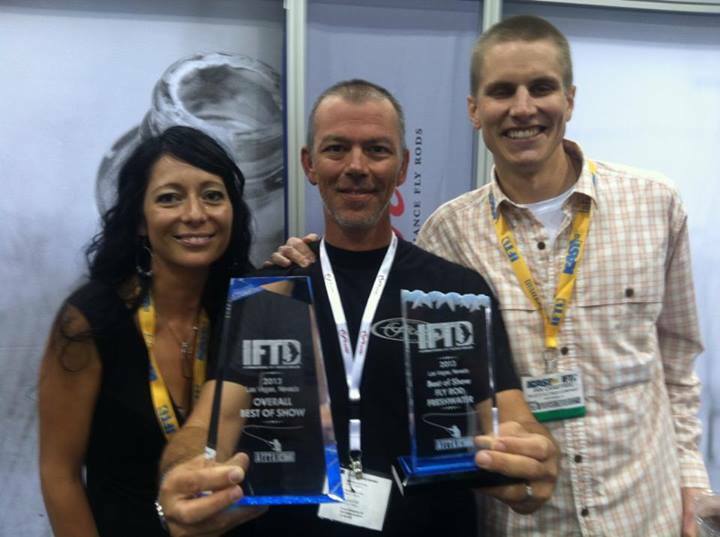 Before I start on my own praise, I suppose I should point out that the Radian cleaned house at this years 2013 IFTD show in Vegas winning Best New Fly Rod & Best Overall New Product for 2013. Obviously I’m not the only one who gave it two thumbs up! Distance: The first thing I notice when I pick up the Scott Radian is how lightweight yet still powerful it feels. It’s like when you tee up with a new driver, and while it feels light, you know it is going to crush off the tee box. It’s always my first instinct to strip off all the fly line on a 9′ 5wt and chuck it. The radian is certainly not Scott S4S stiff but you can still hit the rod extremely hard without shocking it. Similarly, you can apply a controlled and comfortable casting stroke and still hit the long ball. To me, this shows a rod is adaptable through a lot of different casting strokes and abilities. Accuracy: After swinging for the fences, I was really curious to see how accurate the rod felt. After this years Gopro Games I don’t know that I’m one to speak on fly rod accuracy, but I still think I know my way around the end of a fly rod. When I cast the Radian towards a target, I feel stability in the rod as the rod bends and unbends towards the target. By that I mean it has balance and you don’t have to physically keep the rod inline to the target. The Radian certainly passes this test and I will be at the Gopro Games next year with a Scott Radian and a mission! Short Game Casts: Most of the casting we do in Colorado is short range hand to hand combat. For this reason, fast action parking lot casting rods don’t always make a ton of sense when we actually have to use them as a fishing tool. Even so, I was impressed that even with just 10-15 feet of fly line out of the rod I could still feel the line. 2. Water Test: How Does the Scott Radian Fish? The real test of a rod for me is on the water, not the Parking lot. 90% of my casts are spey/roll casts and it’s hard to get a feel of how a rod performs waterborn casts until I wet a line. I fished both the 9′ 5wt and 9’6″ 6wt Radian and impressed with both. 905-4 Scott Radian Water Review Test: The 9′ 5wt Radian was lined with a 5wt Rio Gold Fly line. The rod adequately made the “touch and go” spey cast but didn’t have quite enough bend on a shorter more traditional roll cast. However, if that is what I wanted I’d take my Scott G2 (the best roll casting rod on the the planet). If I want versatility in a fly rod, the Radian is the answer. It has enough backbone to cast into wind yet still roll casts reasonably well. The other thing I look for in a rod is how well it mends. Mending line is more than just flipping the line over. A good mending fly rod is one that bends and pushes through the middle of the rod and then releases a belly of line crisply from the rod tip towards the conflicting current. Mending: The 9’5wt Radian mends as well as any other rod in it’s class. I’m anxious to try a 6wt Rio Trout LT line on the Radian and I bet it will roll cast and mend like a dream! The longer belly of the Trout LT fly line allows for better mends and overloading it just a bit helps you feel the fly rod loading on a roll cast just a bit more. As for fish fighting capabilities, the 9’5wt wouldn’t be my 7x fly rod, but it certainly has enough touch at the tip for 6x on down. I’m anxious to fish the 9′ 4wt. which might be the perfect South Platte River and tailwater Fly rod for light tippet, versatility and backbone to turn big fish. 956-4 Scott Radian: When roll casting the 9’6″ 6wt Radian, I used a 5/6 Rio Switch line that is simply made for this fly rod. It loads the rod deeply through a roll or single hand spey cast and stack mends like a dream with the extra 6 inches. It’s also considerably lighter than the S4 which makes fatigue from an extra 6″ a non factor. This rod can definitely pick up the heavy nymph rigs and chuck them a long way, carry a long drift, and has plenty of hook setting leverage when nymphing deep or on hooks sets 40 feet out. Let’s be honest, looks aren’t everything but it’s an initial attraction. Like the rest of the Scott fly rod family, Radian is smoking hot! and even if it fished and casted like crap I’d still have to have one! These rods are simply beuatiful. Each and every Radian is handcrafted start to finish in Montrose, Colorado by anglers who I’ll never hesitate to say know fly rods. Beauty, power & grace…what else do you want in a fly rod!?! ARC – Advanced Reinforced Carbon reduces torque and increases strength. Handcrafted in the USA – Built from beginning to end in Montrose, Colorado.